Section 4(c) of the Wilderness Act prohibits the use of motor vehicles, motorized equipment, motorboats, landing of aircraft, and all other forms of mechanical transport. Section 4(c) of the Wilderness Act provides two narrow exceptions that allow motorized or mechanized uses in wilderness for administrative purposes: 1) in emergencies involving the health and safety of persons within the area; and 2) when a motorized or mechanized action is necessary as the minimum requirement for proper protection and administration of the area as wilderness. Most Alaska wilderness is significantly different in terms of motorized use compared to the lower 48 due to special provisions in the Alaska National Interest Lands Conservation Act (ANILCA) that allows public use of airplanes, snowmachines, and motorboats in wilderness for certain purposes. Even in those limited circumstances where motorized uses may be allowed by law, motorized use and mechanization are always incompatible with wilderness character. Congress clearly viewed Wilderness as a place in contrast to our civilized world, a place where our motors, technologies, and modern contrivances do not intrude. The vast majority of motorization taking place in wilderness today is either discretionary or illegal. Snowmobiles and all-terrain-vehicles (ATV’s) are the most rapidly increasing forms of illegal motorized trespass in Wildernesses in the lower 48, and ATV use is proliferating in some Alaska wildernesses by rural Alaskans. It is increasingly common for wilderness administrators to use motor vehicles, aircraft (especially helicopters), chain saws, cement mixers, power drills, backhoes and bulldozers in Wilderness. Public input is absolutely critical to give managers both the push and the support they need to impose strict limits on both their own motorized activities and those of the public. Section 2(c) of the Wilderness Act defines Wilderness, in part, “as an area where the earth and community of life are untrammeled by man…” Remaining untrammeled is a key quality that differentiates designated Wilderness from other undeveloped lands. To be untrammeled means that natural processes in Wilderness are left free to function without intentional human interference and manipulation. Protecting Wilderness as untrammeled landscape is a key statutory intent of the Wilderness Act. The Act further defines wilderness “as an area to be “protected and managed so as to preserve its natural conditions and which (1) generally appears to have been affected primarily by the forces of nature, with the imprint of man’s work substantially unnoticeable…” The Act envisioned the Wilderness system to be governed by natural processes, retaining its “primeval character and influence…” The hands-off approach directed by the Act provides that management decisions and activities must strive to minimize the level of human interference in the Wilderness ecosystem. Despite the statutory intent that Wilderness be self-willed or self-shaping landscape, a variety of intentional human manipulations do take place in Wilderness, many of them unrelated to protecting Wilderness character. Examples of common manipulations include fish stocking, fire management, wildlife transplants, endangered species management, management of game populations, predator control, and invasive weeds and insect infestations. The popularity of Wilderness recreation is growing nationwide. For many people, recreation is the preferred medium for their Wilderness experience. 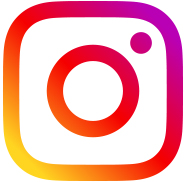 Wilderness is an oasis in an increasingly hectic world, a place where visitors can reconnect with their humanity, challenge themselves, and view the larger community of life to which they belong. Though the importance of Wilderness recreation is undeniable, it is completely dependent upon the preservation of the very wilderness character that makes it unique. Faced with a growing number of users, Wilderness will steadily degrade unless concrete steps are taken by land managers and visitors alike. 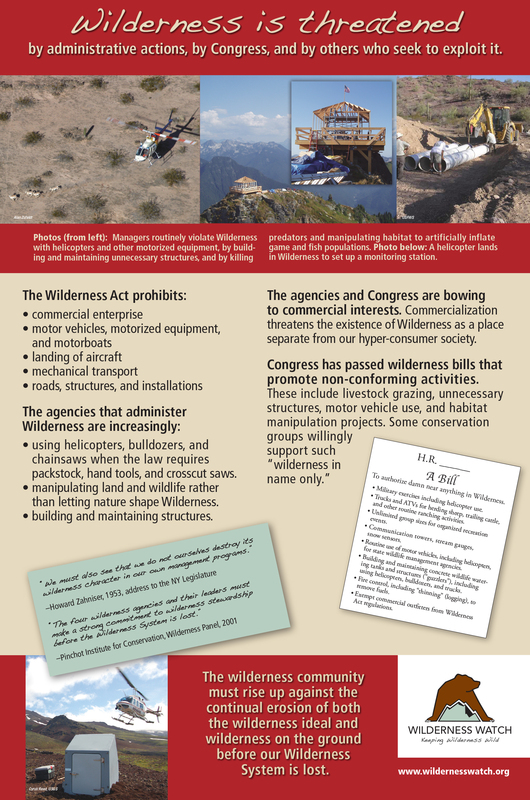 Although the Wilderness Act expressly prohibits commercial enterprise, roads, use of motor vehicles, motorboats, and structures and installations in wilderness (with some narrow exceptions), many of these activities may be allowed by specific entities under the special provisions section of the Act. By identifying this section of the Act as ‘special provisions’ the Act acknowledges that the provisions in this portion of the Act do not comply with the core concepts and stewardship principles described elsewhere in the Act. Special provisions in the Act include provisions for the use of aircraft and motorboats in certain cases; the control of fire, insects, and disease; mineral exploration and mining; public water projects; livestock grazing; commercial services; and jurisdiction of the states with respect to management of fish and wildlife on national forest and BLM lands. A provision in the 1964 Wilderness Act that allowed continued timber cutting and motorboat use in the Boundary Waters Canoe Area Wilderness was repealed in 1978 with passage of new wilderness legislation that now guides stewardship direction for the Boundary Waters Canoe Area Wilderness. Federal lands designated as Wilderness often surround parcels of state or privately-owned land. These state or private parcels surrounded by federal land are called inholdings. The NWPS contains more than a million acres of inholdings. The presence of inholdings within Wilderness was unavoidable during the process of building the Wilderness system that we have today. Another form of private property interest that is found in many Wildernesses are ‘valid occupancies.’ The holder of a valid occupancy does not have full ownership and a deed to the land, but does have a legal claim to the land and may be in the process of gaining full ownership. Examples of valid occupancies include mining claims, right-of-ways, easements, irrigation dams, and Alaska Native settlement claims that are in the process of being conveyed to full ownership. Inholdings present a variety of serious stewardship challenges that can be classified into five main categories: requests for motorized access across Wilderness to the inholding; land speculation and threatened development of inholdings; other property uses that are incompatible within a wilderness context; legal ambiguities related to the extent of property rights of inholders; and multiple legal guidelines governing access through Wilderness. In the western United States, inholdings in wilderness are largely a result of five legislative acts: The 1872 Mining Law, the 1862 Homestead Act, the 1864 and 1870 Land Grant Acts, and the Alaska Native Claims and Settlement Act (ANCSA). Under the first four Acts, public lands were distributed to the private sector and to states to advance westward expansion by settlers of European descent. ANCSA distributed public lands to Alaskan Natives as part of a settlement after Alaska gained statehood. As the United States becomes increasingly populated and polluted, concerns about Wilderness air quality are growing. In the eastern U.S., acid precipitation poisons many lakes and rivers, affecting fish and amphibian populations and killing certain types of vegetation. Across the nation, pollution from large urban centers and industries are affecting visibility levels in many Wildernesses. Aside from the numerous ecological impacts of polluted air, the sight and smell of smog negatively impacts a visitor’s Wilderness experiences, making them feel as if their Wilderness lands are not so very different from the city park. Wilderness provides essential habitat for many threatened and endangered species. Some species may even be Wilderness-dependent, unable to survive outside a remote and undisturbed ecosystem. The continuation of endangered species is a critical component of Wilderness management, and sometimes demands specific regulations and/or actions to facilitate survival. However, it is critical that managers approach these projects with restraint and humility, seeking at all times to limit their impacts on the area’s wilderness character. Rash action, even when well-intentioned, may result in more harm to the species and its environment than if no action was taken. All projects must be subject to minimum requirement analysis and minimum tool considerations. Many Wildernesses contain significant historic structures, i.e. buildings that meet the 50-year-old requirement set by the National Historic Preservation Act (NHPA). Though the NHPA requires that historic structures be fully documented, it does not mandate that the structures be preserved, even if they are listed on the National Register of Historic Places. Structures that are determined to be of significant importance should be identified and protected, though projects to accomplish these goals must be subject to minimum requirement analysis and minimum tool analysis. Indeed, every effort should be made to preserve the Wilderness – truly America’s ultimate historic resource. Structures determined to be of lesser significance should be allowed to deteriorate naturally, returning to the Wilderness from which they arose. The gradual deterioration of historic structures is part of Wilderness; it is evidence of untrammeled natural processes reclaiming the land from temporary human occupation. Section 4(b) of the Wilderness Act lists scientific research as one of the public purposes of designated Wilderness. Due to its relatively pristine nature, Wilderness is an ideal place for scientists to observe and study any number of ecological processes. Research can also be helpful to Wilderness managers, as findings often indicate the overall health of the Wilderness ecosystem and help set management priorities and guidelines. In short, our Wilderness enclaves provide a glimpse of a vanishing natural world free of the human impact and manipulation – its value to science and our understanding of the world can not be underestimated. If Wilderness is to survive as a place “affected primarily by the forces of nature”, it is vital that scientists conduct their research in a manner that preserves the wilderness character of these areas. Research projects that are not Wilderness dependent should take place in non-Wilderness lands whenever feasible. Research should be non-manipulative, allowing natural processes to operate undisturbed.